Proof of Life. Geographically speaking, it’s hot in Texas in the summertime (also known as “play in the playhouse” time). This means I don’t design playhouses that can be completely enclosed. I also don’t design playhouses that can’t be closed in because we also get a lot of mosquitoes in Dallas. I can still recall the time I decided to camp out in my backyard as a child and woke up the next morning about 2 liters of blood light. This means screens and air flow are important. Scale and Proportion. This one is a biggie – most of the playhouses that I have evaluated over the years have scale problems. Either the space is too small for a physically capable child to use – or – the proportion of the playhouse is off because rather than scaling the entire structure based on an 8′-0″ high point, people stick full-size building components into a slightly smaller than normal structure … and it looks weird. Cost. The same builder – Buford Hawthorne Builders – has been building my playhouse since year one. They don’t hold me hostage and I don’t have to beg and plead every year for them to participate. I should be a lot nicer to them because it seems like I am starting to take then for granted. 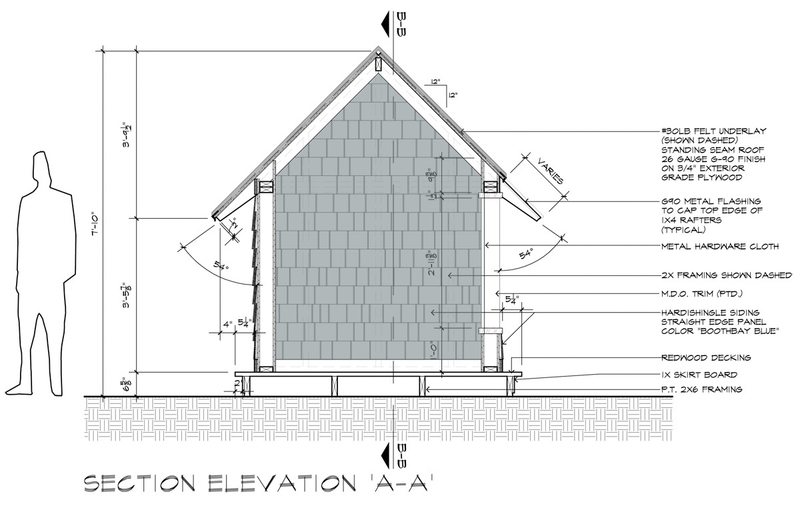 Most of the playhouses I design are so simple that they require exceedingly fine craftsmanship to successfully execute the idea and I know that I can count on thoughtful and exacting execution and that fundamentally shapes the playhouses I design. Okay. That’s not all that interesting – but it is the initial concept sketch I prepared. I wanted to do something a bit more traditional this year and decided that I would try to do something with a “Seaside” sort of feel to it. The size of these playhouses is still 7′-6″ wide, 8′-0″ tall, and 9′-0″ long … and I wanted to open one side up completely with screened openings and I thought it might be visually more interesting to peel the metal roof back to expose more of the screened openings along the length of the playhouse. 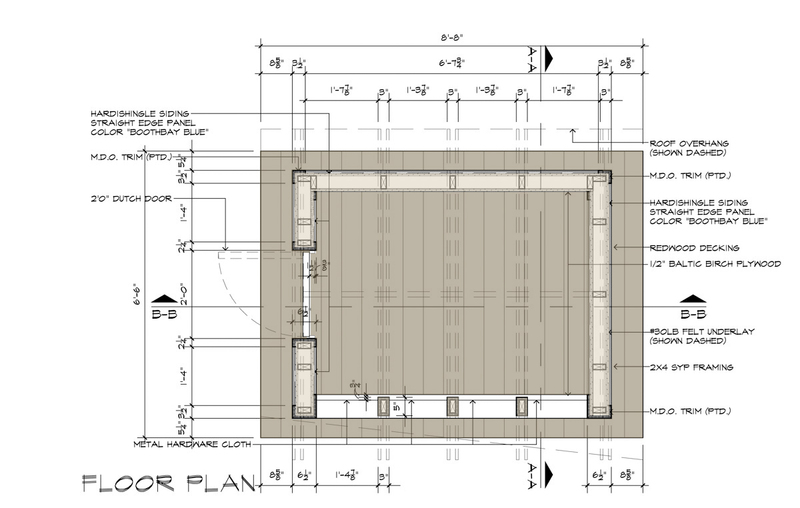 So while most of the country was swimming and putting the grill to good use, I spent my Memorial Day holiday up at the office finishing these construction drawings (and doing my timesheet). Normally I might take a pass on getting this done on a timeline that included working over a holiday 3-day weekend, but I am getting on a plane today and flying to Israel for a week. I can’t afford to let these sit incomplete during that time so I had no choice but to buckle down and get them done. The good news is that I’ve been doing these sorts of drawings long enough that it only takes me about 6 hours to completely work through and prepare the construction drawings. The bad news is that I try and think through every little detail and as a result, spend way more time drawing things that probably don’t need to get drawn. 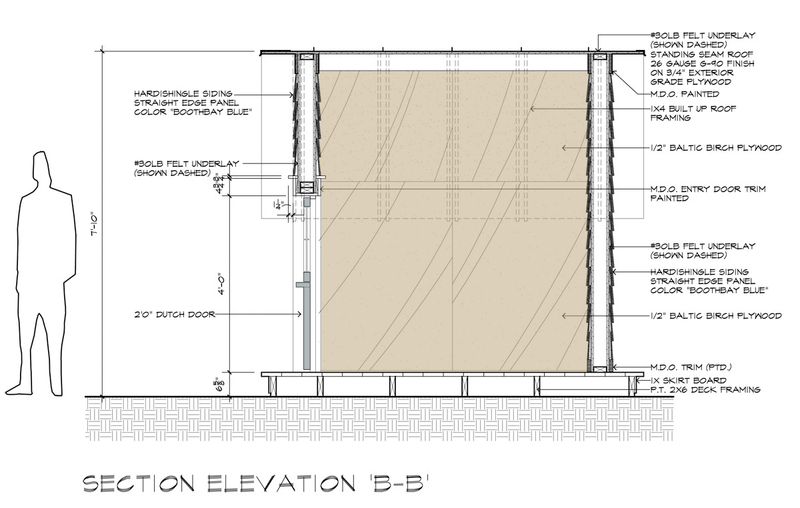 If you click on any of these drawings, they will open up at 2x this size and you’ll get a better look at all the linework I put into these construction drawings. While I could probably hand a doodle on a napkin to my contractor and he’d still get it right, I’d rather not. I make all the drawings to my playhouses available for free to anyone who wants them so even if my contractor doesn’t need this much information, someone else down the road will probably appreciate the effort. I’m using a Hardi Shingle Straight Edge Panel with integral color for this year’s playhouse – I’m hoping it will help expedite the process a bit. 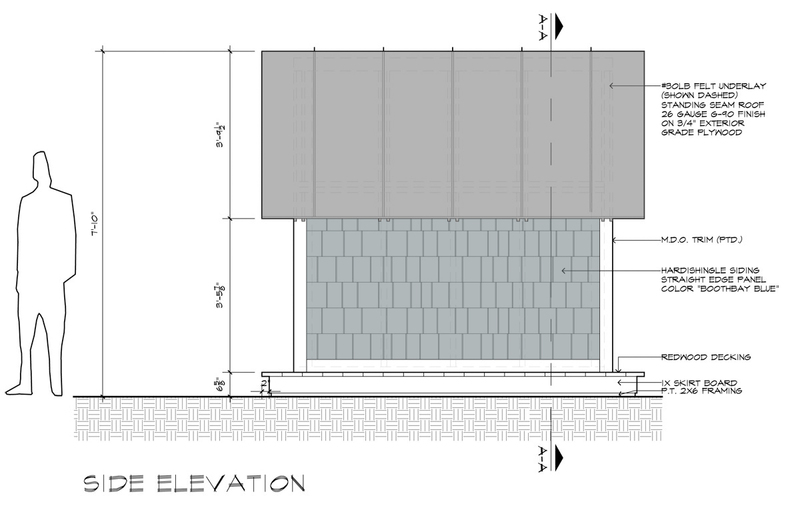 The shingle cladding wraps around the entire exterior but is also works it way into the interior on the two gable end elevations. 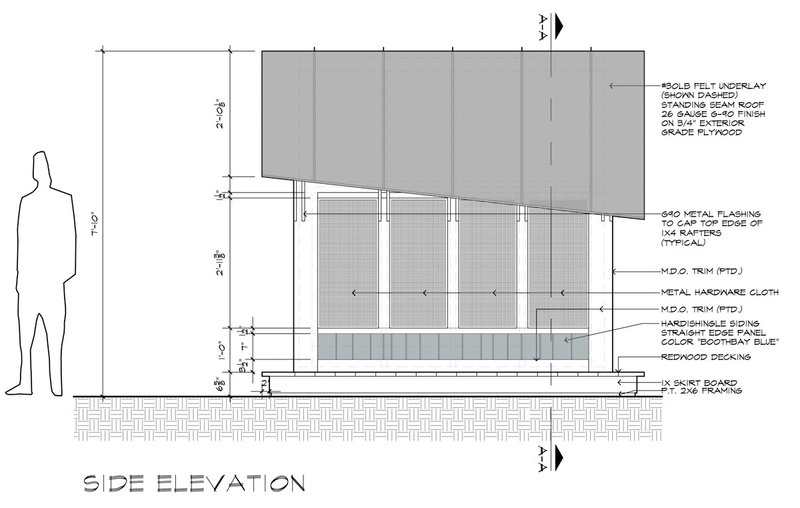 You can see what the interior end walls might look like in the Section Elevation AA drawing above. Here is the screened opening side elevation where I’ve pulled the G90 roofing back at an angle to help generate some visual interest. 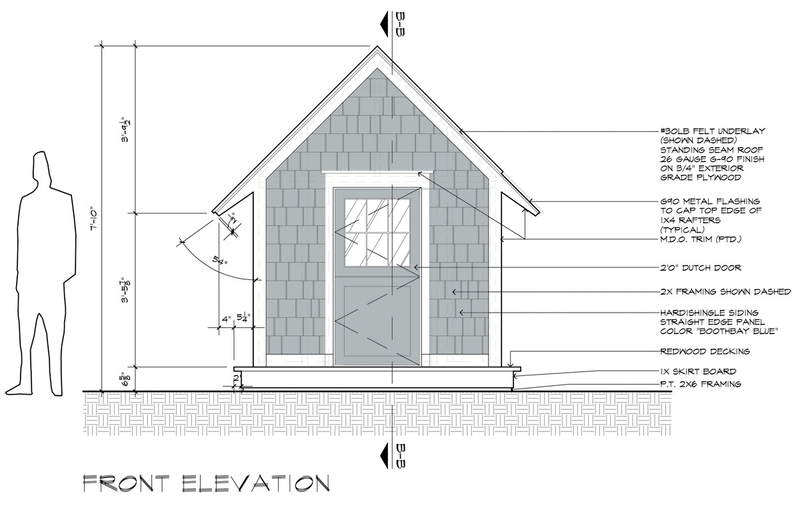 I like the design to be articulated in how the playhouse is built. Peeling back the roof will help show how the roof rafters assemble with the roof sheathing and walls. Opposite the screened in openings, rather than continue the shingles all the way through, I changed the interior finish material to a baltic birch plywood. This should make it a bit more palatable to tack something up on the walls or even use the surface to draw on – something you couldn’t do if the underlying surface (below your craft paper) was a bunch of seams and joints from the shingles. I didn’t peel the roof back on both sides … just didn’t feel like it was necessary. And because this post wouldn’t be complete without having a few plans in place, I’m including the floor plan so that hopefully you can see if the mental plan you’ve been putting together while looking at all the other images was correct. On the left-hand side you can see the Dutch door – and on the bottom you can see the screened in openings (they aren’t shaded), and the whole thing sits on a wood deck. 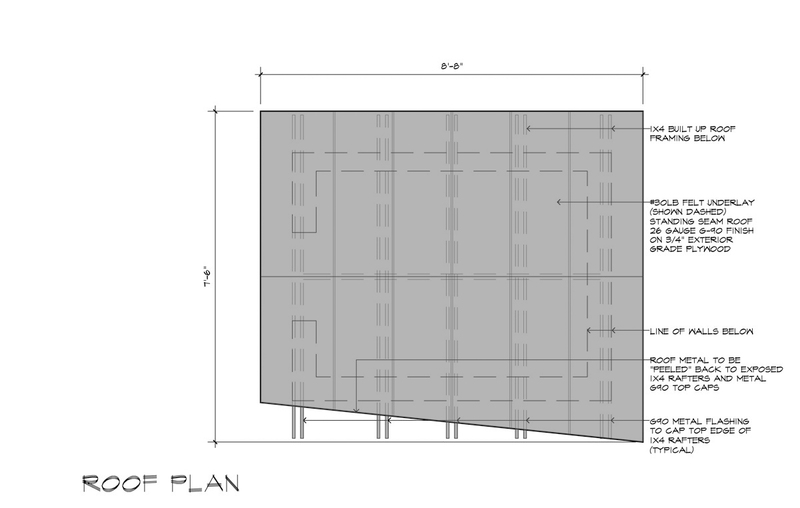 Finally, the roof plan. This was my favorite drawing because it only took about 8 minutes to draw. I hope that you like my playhouse this year – I’ll do one more post that shows the entire thing getting built along with the photos of the final product. I have no doubt that it will look terrific … there’s nothing that crazy here. Hopefully, you’ve noticed that I decided not to produce a million playhouse articles this year – thought I would give you a break and try and avoid “playhouse fatigue”.